Knitting Under Water | Knitting to Survive the Winter in Calgary! If you don’t slow down and look around once in awhile, life will just pass you by. Gia is 14 months old now, and my big girl Fia is six. She is down four teeth and my baby/toddler has 12, working on four more. She has gotten six teeth since January, which has been painful. Starting a new daycare, me going back to work, has meant we are thick in the sick all the time cycle. I listened to someone talk about how sick they were the other day with their sore throat and cough, and quipped “sounds like Thursday around here” which is flippant but oh so true. Gia has a fever almost every week, Fia has one every month. My tonsils swell up every week, taking turns as to which side is worse, then the cough, and mucus, mucus everywhere. Gia is a constant fountain of snot. Everything is covered in it, even the cat. Working, commuting, looking after a family, up three times a night, can seriously take a toll on a body, and I am exhausted. I have no idea when things will get better, but six months after starting daycare is a general rule of thumb. Then Gia will adjust, and her immune system should be firing on all cylinders. Once her eye teeth come in, I am hoping she will take a break from teething all the time. I have put a photo of myself with the girls in this post as a friend has pointed out the importance of having photos WITH your children. So many are just the kids. However if I’m not around anymore, what will they have to remember me? Some photos of me would be a good start. In the meantime I am striving to be gentle on myself, and not be upset if I don’t do all the things for all the people. It is time to prioritize, and forget about the rest. Simple food, make the money, pay the bills, keep on keeping on. Keeping all the balls in the air is easier if there are fewer balls. The girls are good, my Roses. Things are moving forwards, life is full of small pleasures such as the laugh of a baby/toddler as her sister does silly antics to amuse her. Nobody makes Gia laugh like Fia. This is the official Baby Layette for our new little girl. I had the yarn for a few years and so wanted to use it, plus I still do like green for babies. Originally I was very set on using one of my grandmothers old patterns, as I did for Fia, but then I changed my mind and bought a brand new pattern, the Nouveau Ne layette from the Yarn Harlot. It uses the bee stitch which took some research to understand how to do properly, but then became natural. I had to do some adjustment to accommodate the three colours. but I really like how it turned out. Next up is a bunny hat, using up some old stash yarn that I had left from Fia’s layette. I don’t know why a bunny would be green, but it is cute none the less. This hat is a bit of a pain to make, but the end result is very cute and well worth it. I need to work on my ribbon bow making skills. I am due with a second baby girl in December, and I have been hard at working making some little items for her! She is a little sheep, so I had to make her a sheep hat. I made two, as I participated in a swap and sent the second one over to England to another little baby sheep. This is such a cute pattern, and I cannot wait to see it on our little girl. She also had to have her own Baby Surprise Jacket, and this skein of Blue Moon Sherbert had been hoarded for just such a purpose. In my mind, this is great baby colours, nice and bright. I was going to make a more traditional sweet baby cap with the leftovers, but Mr. J commented on how much he loved Fia in her Stella Pixie Cap, so I made one of those instead. I ran out of yarn for the button band, but a leftover ball of Blue moon in baby blue complimented the Sherbert colour nicely. The countdown is on for when Baby 2 will make her appearance, she is welcome anytime after Dec 1! Knitting Group KAL – Starshower! 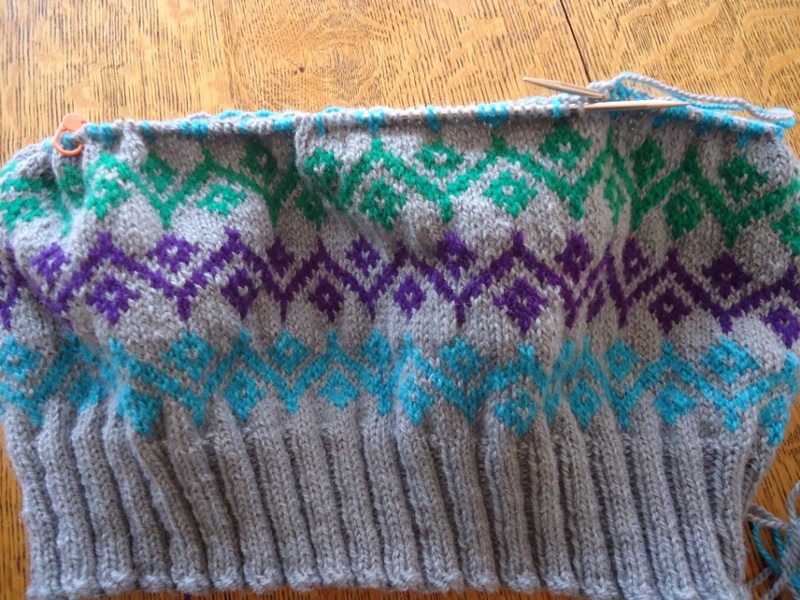 My local knitting group was talked into doing a KAL by me, as I really wanted to knit Starshower. It is the pattern of the spring and summer, and all the cool kids are making it! I’m not ever going to be cool, but it doesn’t stop me from trying! I talked M into trying it out, and together we talked a whole bunch of other people in to joining in. It turned out to be a challenging pattern, especially for those newer to knitting! New skills included the garter tab cast on, short rows with wraps, lace knitting, keeping track of all those increases, and knitting in the round among other items. I made mine out of purple Spring Harvest Farms mohair, which is very, very warm, but didn’t have enough yardage to complete the last two rounds. None the less it is long enough to cover my shoulders and chest, which means it is extra warm! I am thinking about making this again with a thinner yarn of which I have more yardage, but I haven’t done a final decision on what to use as of yet. I know some of my friends struggled with this pattern, but I also saw them grow as knitters and learn so many things they thought were beyond them. I had a lot of fun. We haven’t drawn prizes yet, but will soon! We are also busy coming up with plans for another knit along which should start January 1 ish. For our knit along participants had to start a Starshower, post one picture of it, but not finish it to qualify. 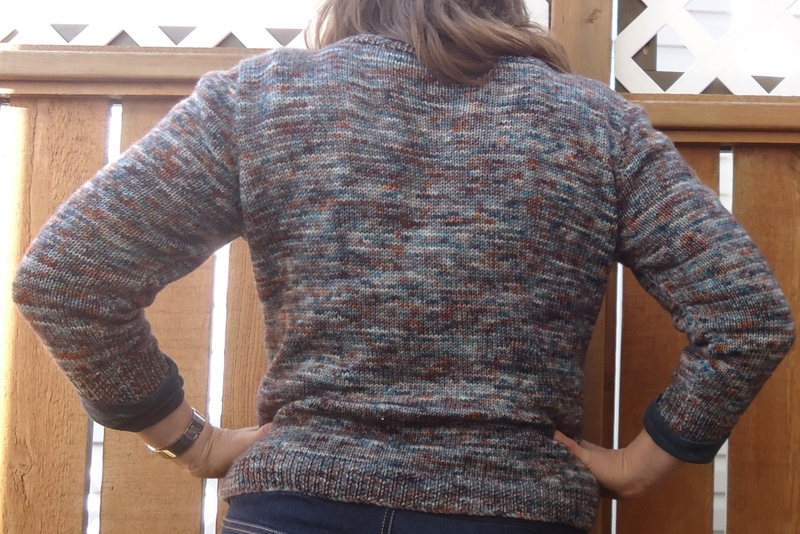 The Canada KAL finished up in September, but I still have three projects that I haven’t talked about yet! My Newfoundland project was a headband named Sherwink. This is named after a location in Newfoundland, but the designer is not from there, nor is the yarn. A little bit of a stretch, but the judges said okay for this collection of patterns, whew. I had seen this headband before, and had even lucked out in getting it for free when it was available for a short time. I used some leftover Pashmina, and I enjoy the result. My Yukon/Northwest Territories/ Nunavut project was a hat from the talented designer Michelle Krause. She has a lot of great patterns to choose from. I had purchased this Noro long in the spring, and it made a really great squishy hat. I have already given this hat away as a present, which is a tiny bit sad, as it was a nice hat. But also a great present for an old friend. The important thing to note about a designer from the north is that they know a thing or two about knitting warm hats. The double layered deep brim on this hat, plus the close gauge and thick yarn ensure this will be warm indeed. And for my finale project, my Flue by Ewe socks! Canadian yarn, Canadian (Calgary) designer, Canadian feet, Canadian designed shoes. These socks have two tiny cables up the side, and a really awesome colourway. I love how they are not striped, but have little tiny almost stripes. If you get a chance to look at Two Birds Knitting Co. yarn, or better yet a chance to buy it, snap it up! The base is very good, tightly spun yarn with a decent amount of nylon, and the colourways are incredible. I do love my new Fluevogs I got in Winnipeg, they are comfy and very cute. All in all, a great KAL and thank-you to the Calgary store The Loop for hosting this. We learned a lot about great Canadian Designers and yarn. I even won two prizes as the contest went on! They are having another knit along next year centered around trying new techniques, which sounds like fun. Instead of having to participate every month you can choose which months to join in, and still be eligible for prize draws. I really enjoy using up almost all of a yarn, so that I don’t have to put it into my leftover bin. I like to have just enough left so that I can keep it in my odds and ends bag in case of repairs needed in future. 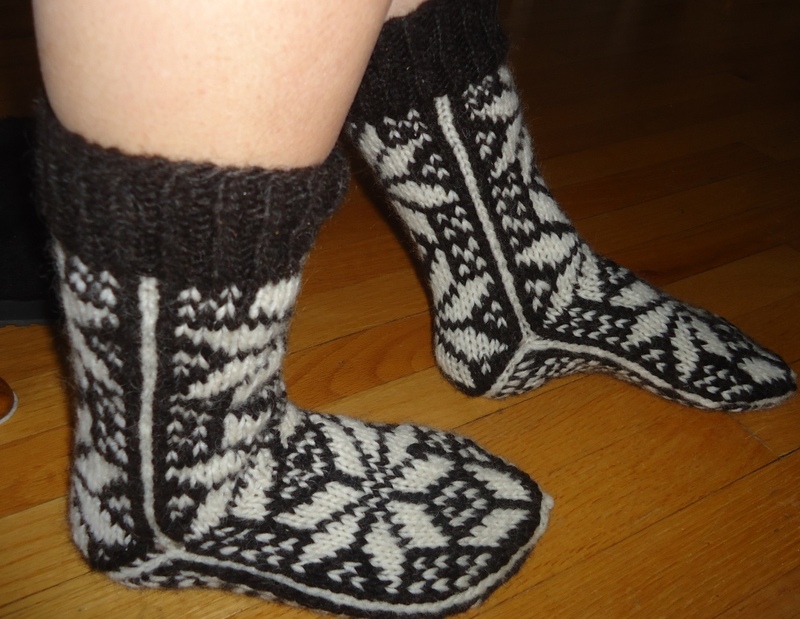 After I finished my sweater knitted out of my brown and white lopi yarn from Bragg Creek, I had enough to make a very nice pair of wooly socks/slippers. I still haven’t gotten a pair of leather soles to fit over these, the search continues. They are so warm, and I’m waiting for next winters freezing temperatures. These took some time as I was doing okay until I got to the heel part, which was tricky to figure out. I did manage to figure out the instructions, and lo and behold they turned out fine! Another new technique of doing an “afterthought” foot almost. 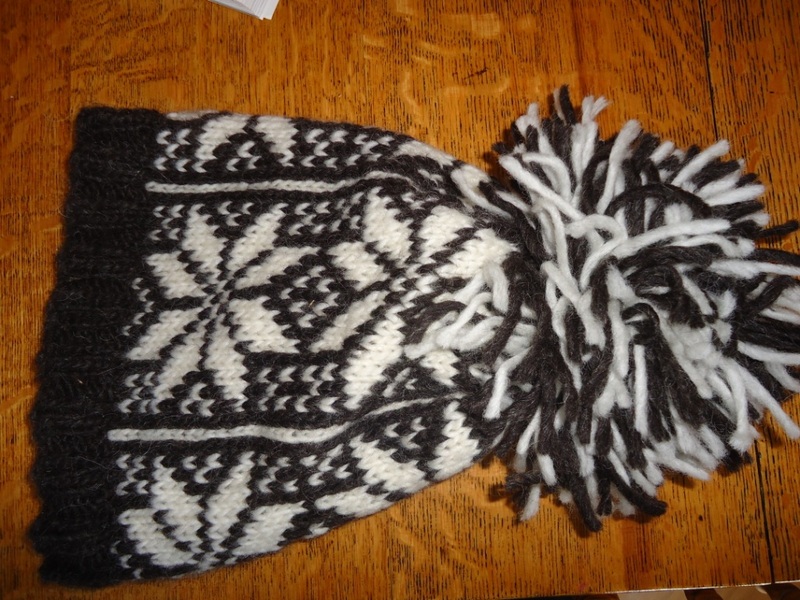 But then I still had more yarn left, so I made a hat using the snowflake motif from the sock. I had so much yarn this hat got a HUGE pom-pom for extra awesomeness. This will be a very warm ski hat, if I ever go skiing again, and is one of my 15 hats in 2015. One of the reasons we haven’t tried skiing yet is that two years ago my brother broke his leg skiing, and Fia is absolutely sure that if you go skiing you will break your leg. So she doesn’t want to go. Still. Maybe next year! Presenting my first attempt at a custom fit sweater! And the shoulders are too wide. I guess I got my measurements a little bit off? It is not so bad that I would rip the whole thing our and redo it, which is what the fix would almost need to be. Otherwise I really like the simple construction, and V-neck which you can’t see in this photo. I will spend some time gushing over the Western Sky Knits yarn, dyed in a rust, blue and grey colourway. I really love it and am so glad I impulsively snatched it up. I alternated skeins so that I got a really nice balance of pattern without any pooling. Just lovely. I think I need to redo measurements, perhaps with a friend this time before I attempt another custom fit knit! It is the last week of summer, and I’m itching to finish up projects before September 1, of the start of the fall. Even not having gone to school in so many years, this will always be the start of fall for me. I have been working on these three sweaters all summer, wildly casting on the new project before finishing the old one, and I am almost to the end of each. I am knitting the sleeves of the beige/crimson summer cardigan, starting the sleeves of the Ursula, and finishing the yoke of Lupine (as I pull the yarn off the bottom. I will then need to reknit the bottom, sigh). I learned new skills with Ursula, crochet reinforced steeks, and am about to do another short row cap sleeve, which is always challenging to get started on. Can I finish all of these in a week? No, but perhaps I can finish up two of them. In anticipation of September 1, I have started a pile of potential. These are the projects I hope to tackle in the fall! 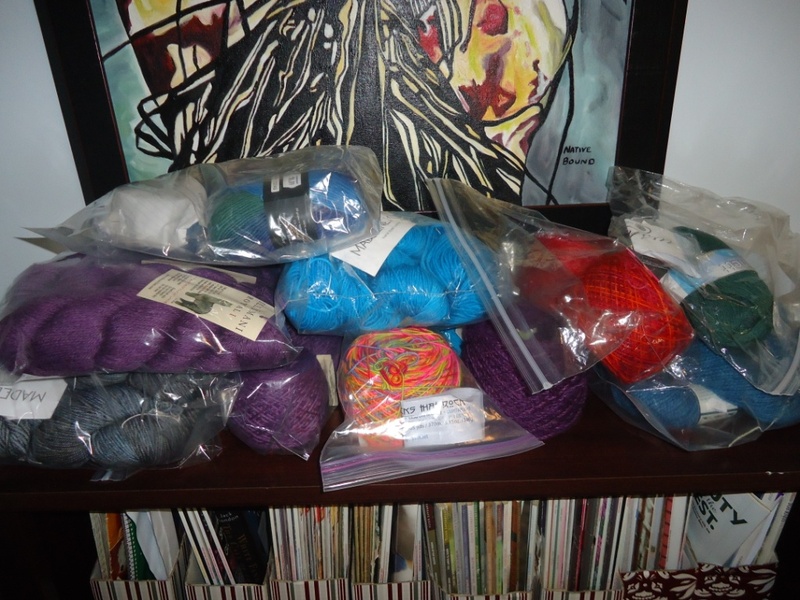 I enjoyed pulling all this yarn out, and am slowly winding it up. My knitting group is doing a Starshower knit along, I have my last project in the Canada KAL to finish, and there is 3 sweaters worth of yarn there. I think I know which project is up first, but I’m undecided after that, hence pulling all the potentials out to look at. Oooh I can’t wait. Along with the goal of completing WIP by Sept 1, I am also hoping to present all of my FO’s by then, as I am very behind. I did manage to complete some things this spring and summer! Next up will be a sweater I finished just in time for it to be too hot to wear! WIP: Wednesday, at long last, and two sweaters no less! This is my Ursula sweater from Kate Daties, in the yarn acquired last year at Olds that just says “Quebecor” on the label. No other info. I just loved the three contrasting colours together, and I still do. Once I swatched the pattern I realized I was getting a much larger gauge than the pattern, so I am winging the sizing. Even the smallest size had too many stitches. This is a fully steeked sweater, and I am actually finished the lower body, and about to add the arm steeks. It will be fun once I start cutting it open! The yarn is very wiry once knit, so not for a fan of soft yarn. I am thinking it will be a hard wearing sweater, and low pilling, which I like. As normal I am worried about running out of the grey, even though I did buy all they had. I am at the arm holes now, and just finishing off my second ball. Crossing fingers I won’t need to do short sleeves! 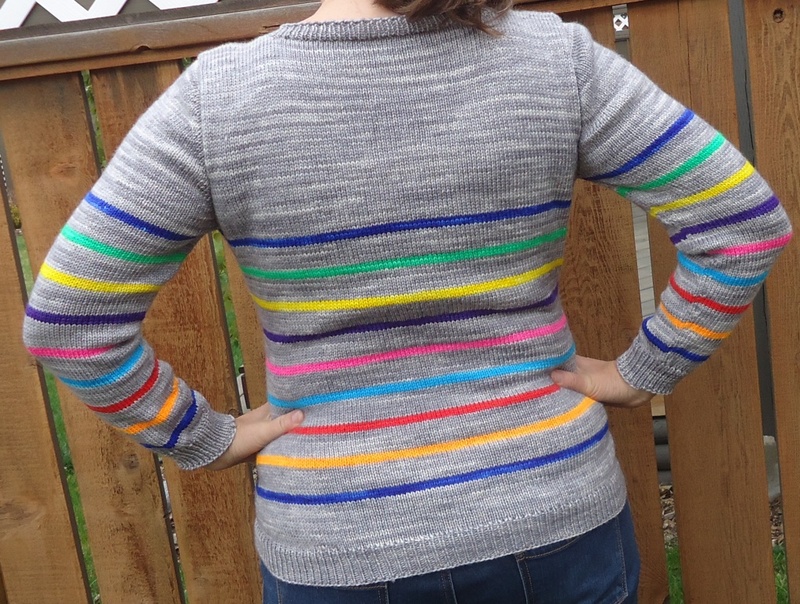 This sweater is the Lupine cardigan from Wooly Wonka, a lovely simple design for summer. 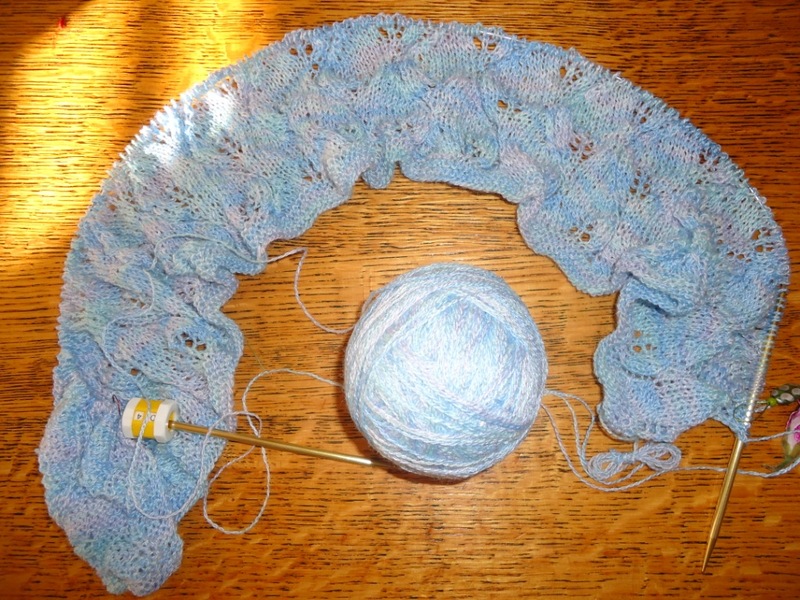 I have had this wool/silk etc lace yarn for a little while, and it is perfect for this summer cardigan. It is growing slowly, but I am approximately five inches into the body. I was attempting to join a knit along with this sweater, but alas I am too slow. This is mostly as I am splitting my knitting time between the two projects, rather than dedicating all my time to just the lace cardigan. I love both! Wow, did this sweater turn out nicely! The Better Breton pattern is very, very, very good, and makes an attractively fitting sweater! I also managed to pick the right size, and get a good fit at the shoulders. And of course, who does not love a rainbow sweater? Fia has requested one, so that is on the list to make. With the rainbow yarn kit from Rain City Knits I have enough yarn left to make one to two kids sweaters. I had run out of grey below the third stripe on the arm, and ordered three more skeins, so enough grey to make another sweater. The only downside – I had some colour run. I found some information on how to fix it, I just need to do the work now. I intend to wash the rest of the rainbow yarn before I make the child’s sweater. I even got to wear this to knitting the other night when it was a chilly rainy day. I have put it way until fall, which is sad as RAINBOW.